Proceedings of the Twenty-first Vertebrate Pest Conference, (VPC-2004). Published at the University of California, Davis, Published October, 2004 372 pp. ISSN: 0507-6773. 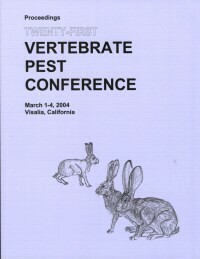 Proceedings of the 21st Vertebrate Pest Conference March 1-4, 2004. Visalia, CA, arranged by the Vertebrate Pest Conference. Editors Robert A. Timm and W. Paul Gorenzel. Description: Rodents in Bangladesh Deepwater Rice, Reproductive Control of Vampire Bat: An Environmentally Friendly Alternative and Oil Spill Situations.